The Nokia Imaging SDK provides more than 50 filters and effects for developers to use and combine them to create new filters. Moreover with SDK 1.0, It allows us to implement custom filters and image providers. 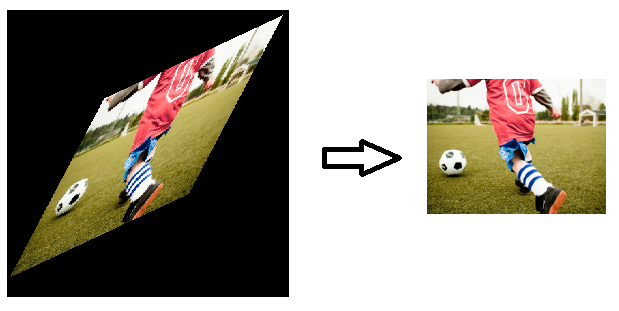 After Nokia Imaging SDK graduates from beta, there were lots of changes. I think it become more difficult to use, but It become more flexible and allows almost anything we want. With the new SDK, custom image source and custom filter introduced which I excited most. It become more difficult to use because of to add/undo filter we have to build pipeline like Image Source > Effect > ... > Renderer. In beta version of the SDK, we could simply add/undo filters only calling one method. About custom filters, It's confusing that we can't use them as we use built-in filters because CustomEffectBase is not an instance of IFilter interface. Also custom filter doesn't allow to change output size, sourcePixelRegion.ImagePixels and targetPixelRegion.ImagePixels implemented to be equal size iin the SDK. Because of those problem I implement a framework which extends Nokia Imaging SDK, solves those problem and gives more extensibility for further needs. In this article I'll explain problems and how I solve those, custom filter implemantation and technical information about framework in detail. Also you can find sample filters which are used for image processing. Stay in touch, more custom filters will be added to framework in the future so watch here and github page. Please read all documents about Nokia Imaging SDK to understand this article. Use to extend custom filters. It provides custom filter to post process factory. So after custom filter processed, post process factory's filters processed. For example, QuadTransform filter implementation. Use to extend custom filters. It provides custom filter to pre process factory. So before custom filter processed, pre process factory's filters processed. IPostProcess solves the problem which is custom filter can't change output size of an image. Normally after we use a customfilter, if we want to change output size, we have to call ReframingFilter. 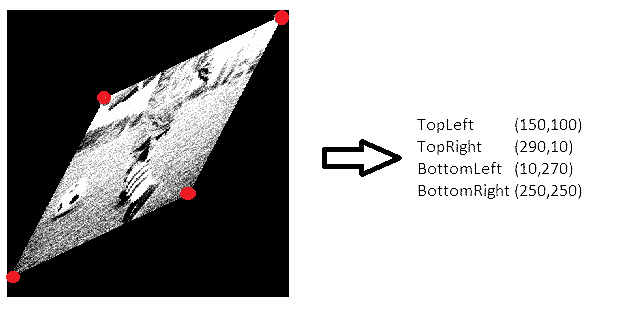 For example, I need to get Quadrilateral object from image using QuadTranform filter in sample filters. Lets says image is 800x600 and I want object to be 300x300. My filter get object pixels to "targetPixelRegion". But "targetPixelRegion" dimension is fixed to 800x600. So after custom filter, I have to useReframingFilter. As shown in the picture. With IPostProcess, if QuadTransform filter added, ReframingFilter filter also added after it. So when filters applied to image, result will same as above. Also that if Undo() method called, both ofQuadTransform and ReframingFilter filters will be removed from history. Same as IPreProcess will be needed for different situation. This class is the main core, everything happens here. Factories derives from this class. It has Input and Output as ImageProvider so that it builds pipeline with another factory. 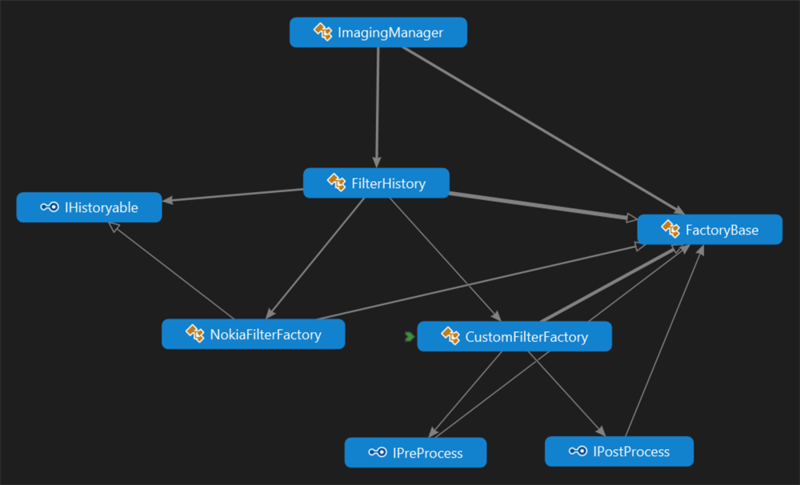 There is already two factories; CustomFilterFactory for customfilter and NokiaFilterFactory for built-in filters. In future, there'll be more for same type of custom filters like convulation filters used for smoothing, blurring, etc. This factory stores only one custom filter. If custom filter has IPreProcess or/and IPostProcess interface, with ApplyFilter method, it builds pipeline inside it. This factory stores built-in filters which are added consecutively. This class used in ImagingManager. It historizes factories and It has the key role building pipeline between factories. It connects one factory output to other as input as shown in diagram above. It provides Add, Undo and UndoAll method for filters. I'll be explaining custom filter implementations in different article. Because of all of custom filters implemented for this framework can be used directly outside this framework. Only thing you have to consider, filters are instance of IPreprocess and IPostProcess interfaces, you need to apply pre/post filters manually when you use that filters. You will find more detailed information by following this guide, "Implementations of Custom Filter for the Nokia Imaging SDK"
As far as now, I described confusing things. The most easy part of this Imaging Framework is how to use. It's really simple. ImageStream is whatever you want to use from them. imageControl for viewing purpose. Use image control which is in page. After that, add filters to be applied. The only restriction here, when initializing custom filters, you have to pass ImageProvider. But you don't have to worry about provider, use DummySource. ImagingManager handles and changes it. In sample project, you can see more detailed use of framework. If you want to contribute the project, add your custom filters or you want to improve framework, please contact me over github page. It's my approach for custom filter and built-in filters for Nokia Imaging SDK. I'm not an expert in imaging process, I tried my best and continue to learn new things. I believe Imaging Framework will speed up development of filter based application. I'm also using it with my applications and constantly updated and added new things to it. I'm planning to implement more filters that used for image processing.